Learn about Melbourne's culture and history as you scamper through the city's laneways, searching for the clues to find your mystery restaurant destination. The Legendary Laneways tour from City Quest Australia is a self-guided tour, modelled on an Amazing Race style experience. The tour was quite diverse in the laneways it covered. Whereas some other laneway tours are focused on graffiti-covered alleys, the Legendary Laneways tour also sent us to shopping arcades, dining precincts, and little-known laneways of architectural interest. Throughout the Legendary Laneways booklet are little snippets of local history, informing Questers about where the laneways got their names from and when they were established. One of the more popular laneways visited on the City Quest tour. Armed with the Quest booklet, a pen, plenty of water and sunscreen, my partner and I did the tour, beginning at Flinders Station (like most tours of Melbourne). The first clue, the street on which the mystery restaurant can be found, was put together by answering multiple-choice questions, with solutions to be found in the laneways the Quest sends you to. The questions were not difficult, but there are answers provided at the back of the booklet just in case you can't figure out where your mystery restaurant is. Part one of the tour took us to some of Melbourne's most popular sidestreets and arcades, including Degraves Street and the Block Arcade. The Legendary Laneways tour directs you to bustling laneways in Melbourne's city. The second clue was all about finding numbers. Counting trees in a laneway, determining the street number of a prominent building and finding the year that a set of warehouses were built were some of the tasks given as we explored the brick-paved laneways on the western side of the CBD. Feeding all the numbers we found into the equation given in the booklet, we found the street number of the restaurant. The City Quest tour sent us to this tree-lined laneway. The final part of the Quest sent us to the Bourke Street Mall, where we hunted high and low for the plaques which not only informed us of the area's history, but also helped solve the last clue. The Royal Arcade, the Manchester Unity Arcade and an alleyway bland except for the stars embedded in the bitumen were some of the laneways the booklet directed us to. Solving the final clue, a cipher, was more challenging than the first two clues and we had to stop for a few minutes to nut it out. The stars give this dead-end alley a touch of bling. The art deco elevators at the Manchester Unity Arcade. At the end of the tour, we put all of the clues together to find the whereabouts of the mystery restaurant. While we enjoyed the tour and finished it feeling more informed about the city we often take for granted, walking around Melbourne for nearly two hours left us quite in need of a relaxing meal. When booking your tour, you are given a brief overview of each of the restaurant options. 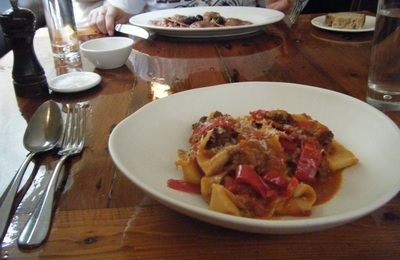 The different cuisine choices for the laneways tour are French, Aussie, Cantonese and Italian. Thinking it would be the safest choice, I opted for Italian. The charming restaurant was fancier than I thought it would be- but that's all I will reveal about it so as not to ruin the surprise for you. The meals we ordered at the mystery Italian restaurant. The tour can be conducted prior to lunch or dinner, with City Quest Australia recommending you begin one and a half hours before your booking time. We began our tour with an extra few minutes on our side, got distracted by plenty of shops along the way, and managed to finish just on time. The Legendary Laneways tour costs $19.95, and does not cover the cost of the meal at the end. You can request to do the tour without ending at a restaurant. City Quest Australia also offers a Marvellous Melbourne tour, also $19.95, which takes you to the city's chief sights. Bookings are made via the City Quest website. Natasha's Legendary Laneways tour was courtesy of City Quest Australia. When: Lunch or dinnertime, any day of the week. Cost: $19.95 plus the cost of your meal. Looks wonderful. Melbourne is well known for its laneways and the great eateries that are dotted through them. The mystery part of it all sounds like great fun.